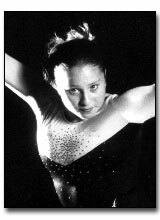 As a Marina High School junior Deborah Mink, representing the SCATS gymnastics club, won the 1995 All-Around National Championship in the Senior National Elite Division. In 1997, the diminutive UCLA freshman recorded career highs on the Vault (9.9), Balance Beam (9.85) and All-Around (39.325), to help the Bruins win the Pac-10 Championship. That same year, Mink’s leadoff score of 9.825 laid the foundation for UCLA’s record-setting bars set of 49.525 at the NCAA Super Six, clinching the Lady Bruins’ first national gymnastics title. Deborah was the gold medallist and All-Around champion at the 1997 Maccabiah Games in Israel. In 1993 and again in 1995, she was SCATS “Gymnast of the Year”. Between the ages 5-10, Deborah was featured in eighteen major television commercials, among them TV ads for Skippy Peanut Butter, Summer Fruits, Oscar Meyer, Fruity Pebbles and McDonald’s.